The Arkansas Campaign for Grade-Level Reading joined forces with the Arkansas Community Foundation to provide grants to five high quality applicants for the Summer Learning Initiative, which supports innovative summer learning programs that increase reading proficiency. The Clinton Elementary School, a longtime Mutt-i-grees campus, is the recipient of one of these highly competitive grants. 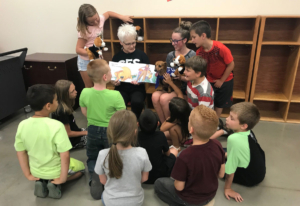 The result is its new summer program, Paws for Reading, which integrates social-emotional learning components of the Mutt-i-grees Curriculum with intensive reading instruction. The program emphasizes literature about shelter pets and gives students an opportunity to read to a visiting dog who participates in the program on a daily basis. There are also events focusing on parents and the community, highlighting the benefits of the program and bringing awareness to shelter animals. Glenda Stagg, who wrote the grant and is directing the program, believes that the focus on the Mutt-i-grees Curriculum was the reason the district received the grant. We’re eager to hear how this program addresses “summer slide” and supports reading skills during the academic year.